Prison affects people in different ways. Lengthy incarcerations have produced a range of sentiments among pro-reform activists: defiance, regret, even both. 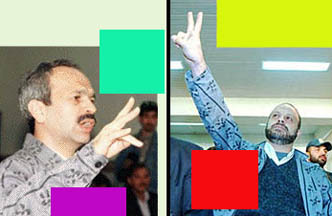 Akbar Ganji's dramatic appearance in his long-awaited trial, charging prison officials with torture, was in stark contrast to Ebrahim Nabavi's sarcastic self-criticism before the notorious Judge Mortazavi. Renowned as the country's best political satirist, Nabavi turned the court into a stage for a stand-up comedy routine. "I suggest prison officials give inmates a pair of prison uniforms to take home so that by looking at them, they would remember to be careful," joked Nabavi . He thanked "his excellency, the prosecutor" for a lenient indictment -- the kind of leniency he said he had failed to notice in the actions of the judiciary. Dazed and confused, Nabavi's conservative critics have been unable or unwilling to read between the lines of his carefully chosen sentences. Nevertheless they feel like they should be pleased. That seems to be why Nabavi is expected to be freed on bail soon. That also seems to be why the anti-reform daily, Kayhan, set aside a large space to publish the full report of Nabavi's court session. His pro-reform associates in the press had a field day, albeit privately, in the interest of their colleague's freedom. Yet the heavy use of sarcasm, irony and double-talk has even baffled the public as to how much they should take Nabavi seriously. Just a week before his scheduled trail, Nabavi, for the first time, described his previous writings as radical. "I don't want to be a hero," he declared in an open letter sent from Evin prison to the press. "After years of writing, I have come to learn that reflecting on one's past deeds is painfully harder than insisting on a script that has been written in anger and haste. Looking back on a not too distant past, I see, on the part of myself and others, expressions of stubbornness, pigheadedness and radicalism in spite of our claims of flexibility and passivity". More serious and somber, however, are the confessions of the much younger Mohammad Quchani, another writer/journalist who is a talented product of President Khatami's heralded era of openness. Winner of the "Political Commentator" award and praised for his penmanship, Quchani speaks out on lessons he says he has learned early in his young life. Lack of professionalism, proper information dissemination and sensitivity to national security and identity, political partisanship and populism were Quchani's characterizations of newspapers which he used to write for in remarkable style. "In the face of truth and the dire need for reform," he said, "moderation must strip its garb." Quchani's definition of moderation now seems to have changed. "The atmosphere of prison is akin to notions of solitude and pondering," Quchani explains while proclaiming to "distance" himself from his articles. Solitude and pondering has not left the same mark on the experiences of all jailed activists. In fact, solitary confinement created enough rage in Akbar Ganji to leave a lasting impression on the prison system as well as the court and judge who are trying him on charges much more serious than those laid against Nabavi or Quchani. Ganji's spirit of defiance after the alleged 108 days of solitary confinement ran consistent with the courage he displayed in publishing shocking revelations about state involvement in the mysterious murders of Iranian dissidents. Taking off his prison jacket and showing signs of bruises on his head and arm which he said he got from repeated beatings and torture, Ganji lashed out at the judge who had once before convicted him to a one-year jail sentence for delivering a speech against Fascism. Ganji's steadfastness on one hand, and Quchani's apologetic retractions on the other, represent divisions plaguing the reform camp over tactics and strategies. Some reformers are lamenting their past "extremist" approach which they now believe was disproportionate to their real ability to bring about change. The unprecedented press freedoms during the "Tehran Spring" which followed the stunning election of Mohammad Khatami, did not make everyone oblivious to the prospect that the newly-found bravery to challenge and criticize is ephemeral.. The fragmented reform movement is now led by forces of caution and compromise as manifested in the mood prevailing over the reformist daily, Hayat-e-No. Borne from the ashes of two dozen banned newspapers, Hayat-e-No moves forward in what it calls "low beams." Recently, Hayat-e-No offered an olive branch to Hashemi Rafsanjani, the head of the powerful Expediency Council, hitherto sharply criticized by reformers, particularly Ganji. Hayat-e-No called on Rafsanjani to show graciousness by adjudicating in favor of a more liberal interpretation of the existing press law in a dispute that has left the Expediency Council as the final arbitrator. On one hand, Ganji knows his counter indictment of the conservative-dominated judiciary could not have been publicized were it not for moderate efforts to make the court proceedings public. On the other hand, Quchani also realizes that conservative appraisal of his turn-around will not go down well with the majority of the public whose desire for change was sparked long ago by himself as well as Ganji.